Lenovo which unveiled their latest device the A7000 in Mobile World Congress earlier in March and Lenovo which mentioned that India would be one of the first countries to get this device. And there have been media invites sent out for the launch event on April 7th in which the device is not mentioned, and we suspect it to be mostly Lenovo A7000. 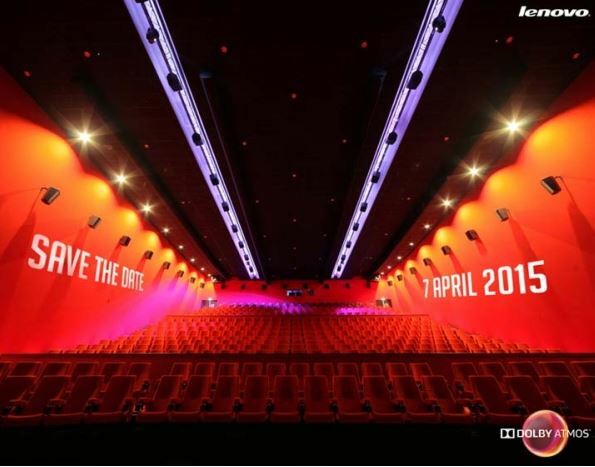 Coming to the invite it has photo of Dolby Atoms theatre with “Save the Date, 7 April 2015” and this mostly confirms it to be Lenovo A7000 as it was announced as the first device to come with Dolby Atoms sound technology. Coming to the specifications and features of the Lenovo A7000 is is termed as a smartphone built for entertainment on a bidget and it comes with a 5.5 inch HD Display with 1280 x 720 pixels resolution having IPS display. The device is powered by a 1.5 GHz Mediatek MT6752m Octa-core processor which is supported by 2GB of RAM. It runs on Android Lollipop out of the box. Aditionally the device supports Dual SIM with LTE support and comes with 8GB of internal memory which can be expanded upto 32GB using MicroSD card support. The camera is also pretty good with a 8MP rear or Primary camera with LED flash and 5MP front or primary camera. The device is powered by a 2900 mAh battery which seems decent enough for the 5,5 inch display at offer. The basic connectivity features like LTE support, WiFi, Bluetooth and other features are incorporated. The fact that the device comes with Android Lollipop out of the box makes the device more efficient in the features at offer. Lenovo is surely targeting Indian market as it sees potential like it has achieved in the Chinese market and hope it keeps bringing more such devices. The Lenovo A7000 will be available for purchase in Flipkart and will be up for grabs through Flash sales like we have seen with the A6000 and the pricing of the device is not yet known and I am expecting it to be priced around $170 to compete with the Moto G 2 in the similar price range.